This smiling sloth design was hand drawn with ink, and then screen printed by the artist! 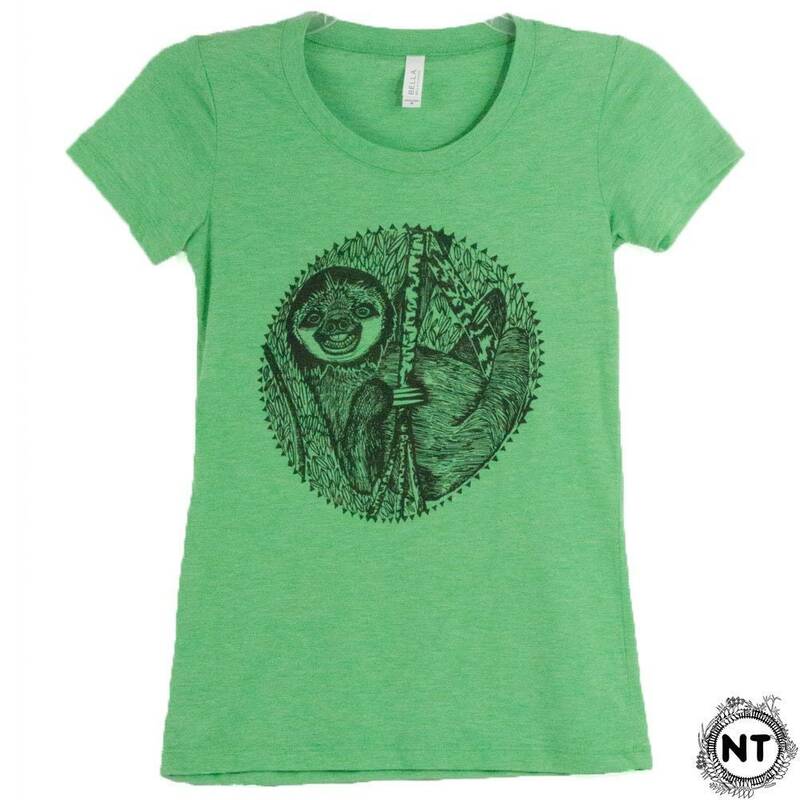 This design is printed by hand with water base ink, and is heat set for machine washability. The ink is ECO friendly, has a light, soft feel to it, and is printed in black on a blue color WOMENS t shirt. --This style shirt runs a little small, and tends to be fitted. --The length is a bit longer, coming below the belt line. There is a size chart located as the very last picture, so be sure to cross reference this with your favorite tee to ensure fit. The size chart is created by measuring the garment flat, so if you feel you are a few inches larger than the chart indicates it will be tight, or more fitted. The fabric stretches about 3 inches more than is included in the size chart. If you are unsure of your size, or are buying this is as a gift please feel free to contact me to get help deciding the right fit. I accept direct checkout, PayPal, and Etsy Gift Cards. I request payment to be made right away at time of checkout. Items not paid for will be relisted, and the order cancelled. Priority shipping includes confirmation and tracking numbers, upgraded shipping is offered, and I do accept international orders. I am not responsible for international customs and any tax that is imposed. If there is a problem with the fit of your new tshirt, please message me through Etsy, to keep documentation of the transaction before you leave feedback. Your happiness is of most concern, and I will honor any reasonable request! I do include size charts in the pictures of all my shirts, so please look over this carefully, and cross reference this with your own measurements. *I offer exchanges but I do not offer refunds. *I will exchange a shirt sent back to me unworn, unwashed, in NEW condition. *I do not assume any shipping charges for the exchange. 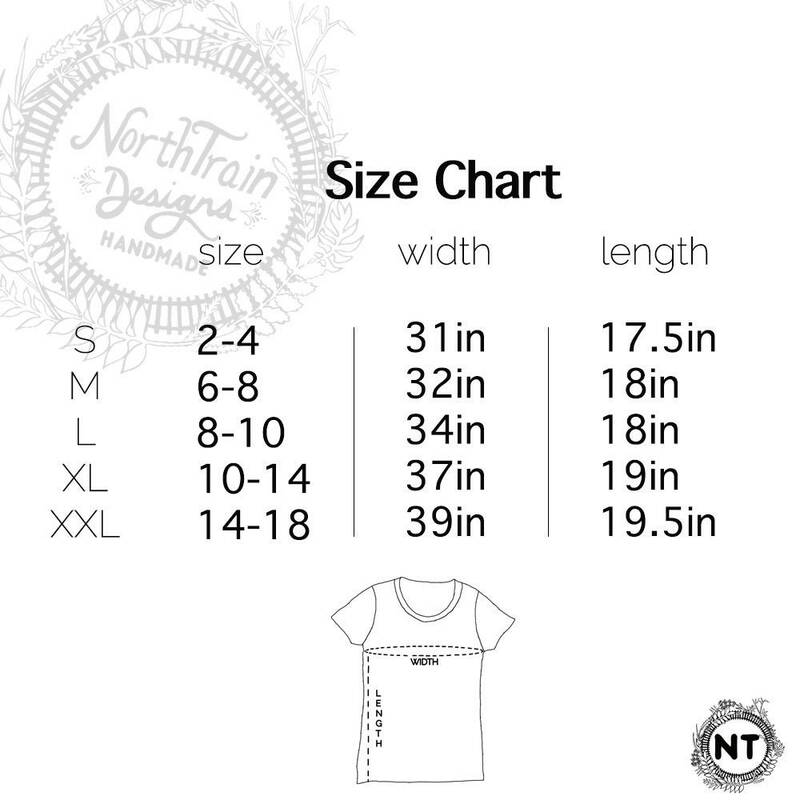 I do provide detailed size charts in the last picture, so please compare them with your favorite tank and tee before purchasing. If you find that you need to exchange for a different size please contact me to set something up. At this time I do not accept custom orders due to the nature of screen printing. I print small runs of the same design at once, and do not print one offs. As my business grows, I am hoping to be able to offer custom shirt colors and styles in the future. If you would like to see a design on a different color or style please feel free to make suggestions!